This year the strawberries have been super sweet and juicy and perfect. Some years they are either flavorless or sour, but they have been perfect. My kids and I have been going through about a quart about every day, just eating them fresh. As I mentioned in my last strawberry post, I’m not a fan of traditional shortcake. No thanks dry crumbly biscuit. Golden Oreos have been my shortcake crush this year. 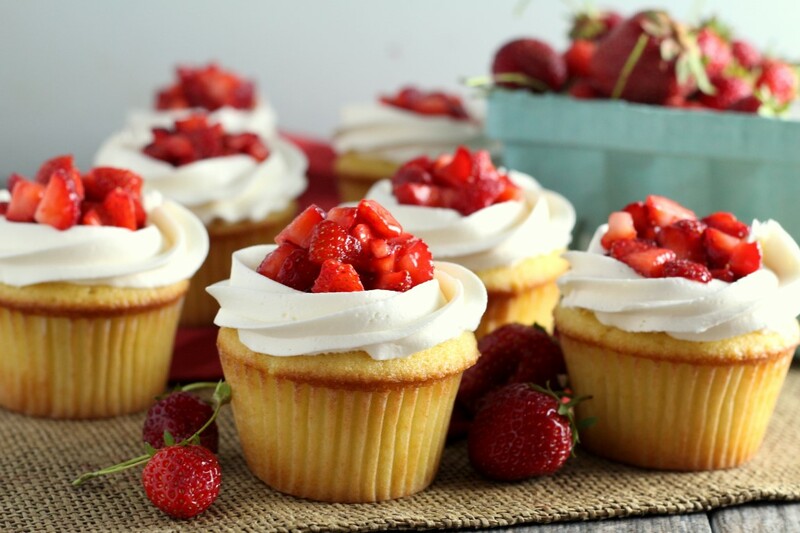 They make a much tastier substitute in shortcake dessert, plus it’s pretty handy to pick up a package, no baking required. 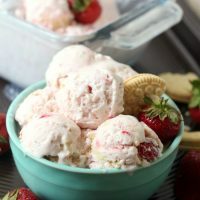 A few notes on this Strawberry Shortcake Ice Cream Recipe. 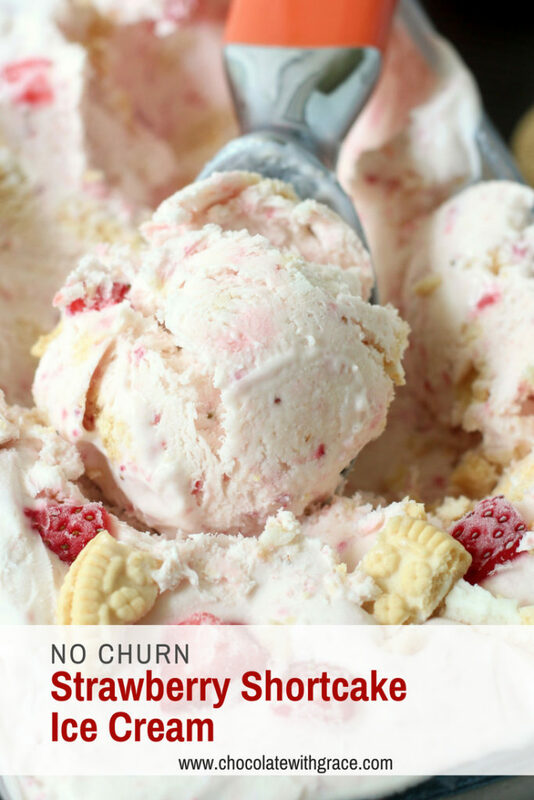 This is a no churn recipe, Yay! You simply whip heavy cream and then fold in sweetened condensed milk, strawberry puree and crushed golden Oreos. The sad part of all that, it has to freeze for 8 hours 🙁 So, plan ahead. In my recipe, I included diced strawberry chunks. It turns out that I don’t like the texture of frozen strawberries in my ice cream. If you’re the same, I would either recommend either just pureeing the additional strawberries or dicing them super fine. Maybe even processing them a bit in a food processor, so you end up with very small strawberry chunks. 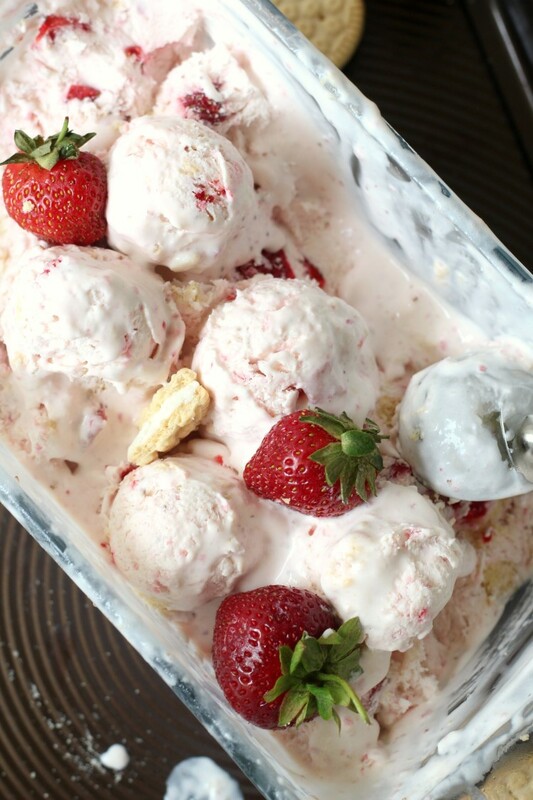 It’s no fun ending up with hard strawberry chunks in your creamy ice cream. 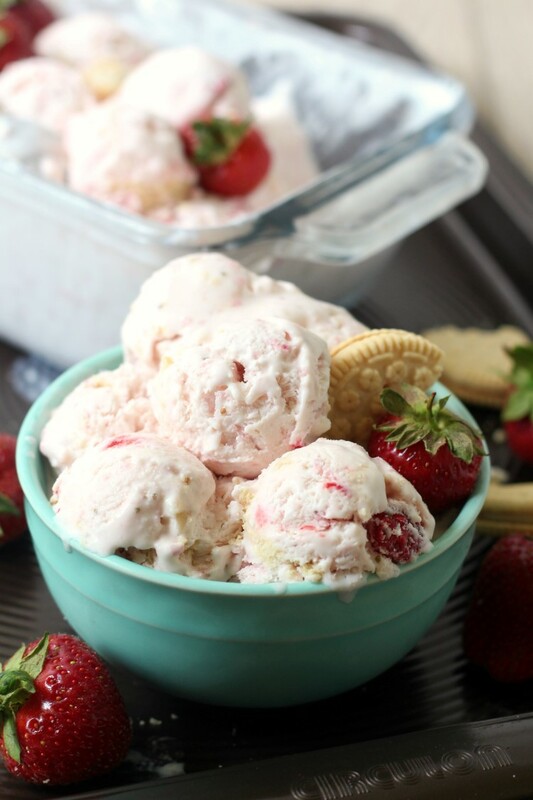 This easy strawberry shortcake ice cream recipe is no churn and uses just 4 ingredients. 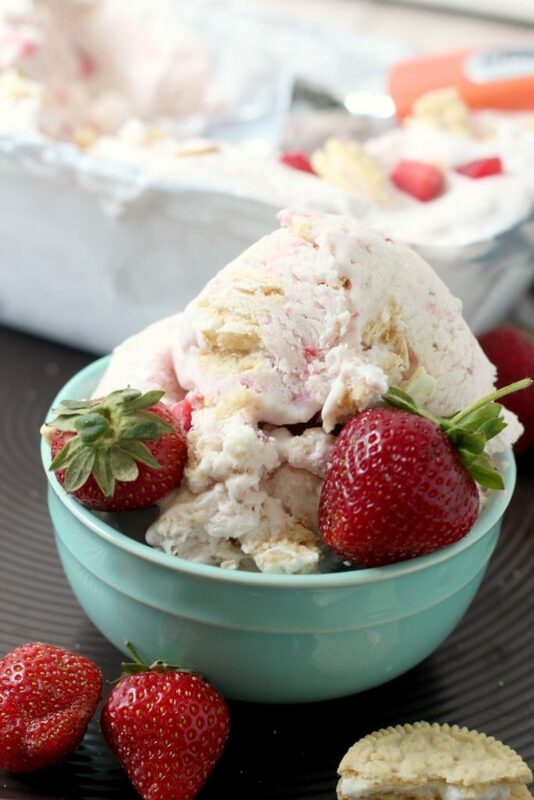 The best way to enjoy your strawberry shortcake this summer. 1 1/2 cup golden Oreos, broken into pieces. I used about 8 Oreos. Puree 1 cup of the strawberries in a food processor and set aside. Dice the remaining half cup of strawberries very small, otherwise you will have hard ice chunks in your ice cream. Set strawberries aside. With a mixer, beat the heavy cream until stiff peaks from. 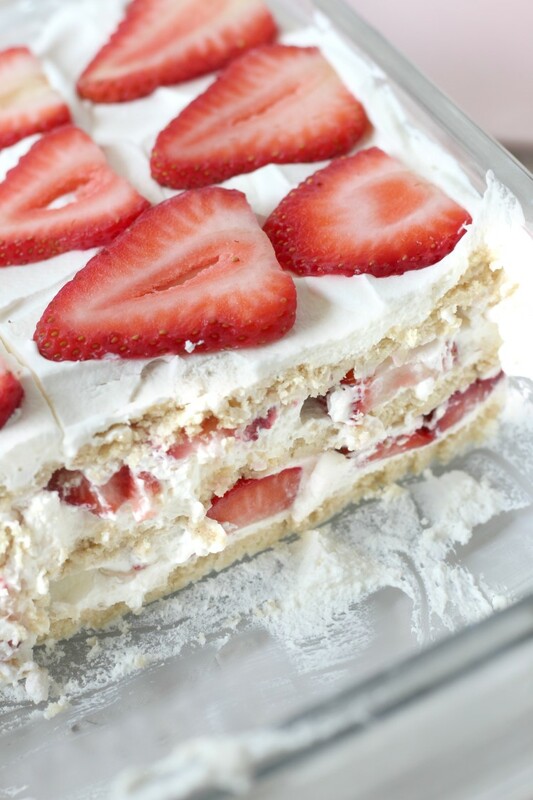 Gently fold in the pureed strawberries and sweetened condensed milk. Gently stir in the remaining diced strawberries and golden oreos. Pour mixture into a 2.5 quart container and freeze until firm, at least 8 hours. 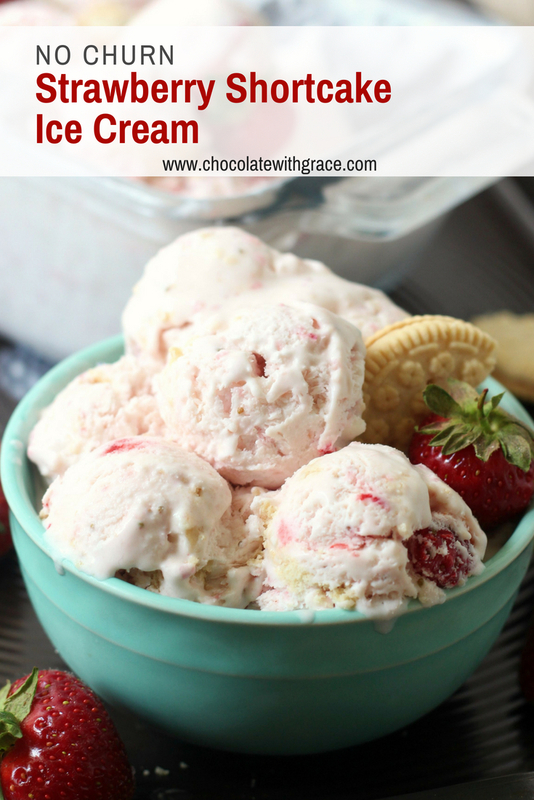 Her are some other ice creams in summer fruit flavors that sound like a perfect treat.